Houston is experiencing a surging demand in the multifamily sector and real estate developers are taking advantage of it. 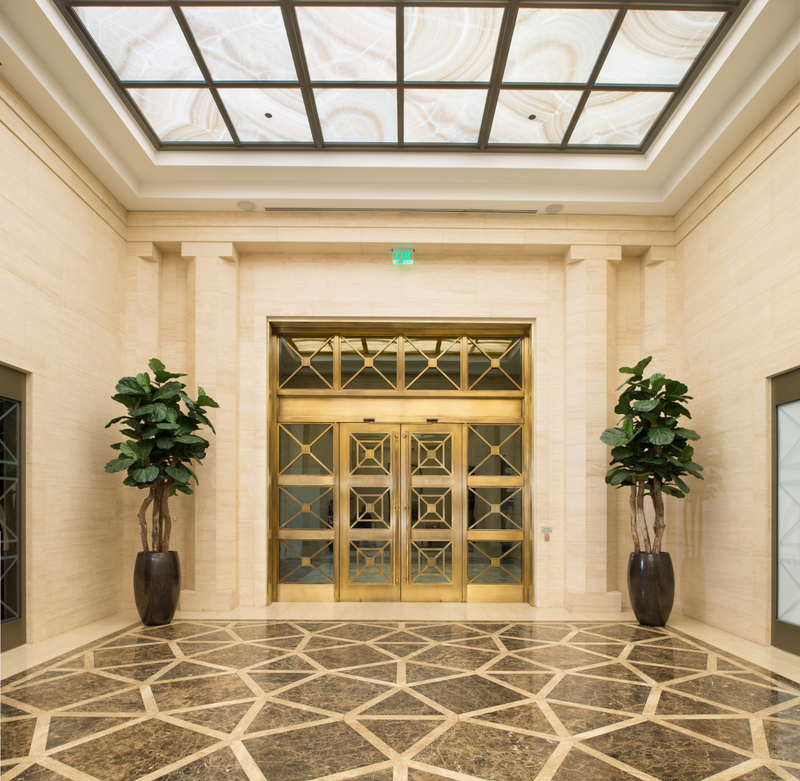 One of the recent additions to Houston’s skyline is the city’s tallest luxury residential high-rise, Market Square Tower – greeting tenants with three pairs of custom balanced doors by Ellison Bronze. Downtown Houston is becoming more than just a 9-to-5 destination for office workers. Thanks to the restaurants, parks, schools, churches, and apartment developments like Market Square Tower, a growing population is calling this area home. The Downtown Living Initiative Program is a contributing factor – providing incentives to developers of new multifamily residential mixed-use developments. This initiative is designed to promote economic growth and stimulate downtown business by bringing new and enticing living opportunities into the city. One of these approved and completed residential development projects is Market Square Tower – a 40-story, 463-unit deluxe apartment tower located at 777 Preston Street in downtown Houston and featuring three formed bronze Ellison entrances. The main entrance showcases a beautiful 60” x 59” arched transom with a decorative bronze grille, custom cut using waterjet technology. Designed to complement the doors’ aesthetic, the two additional entrances also feature impressive transoms – one with adjacent sidelights fabricated to virtually the same dimensions as the door leaves. Market Square Tower is the pinnacle of upscale living in Houston where multifamily resort-style spaces are in high demand. 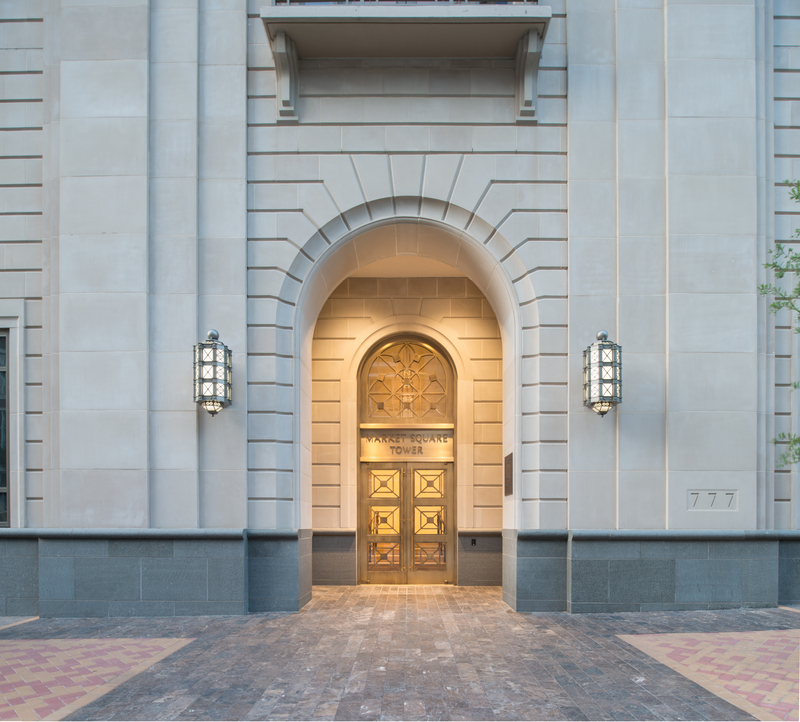 Its exterior brings a new level of architectural beauty to downtown Houston with well-appointed and spacious residences inside. Houstonians have their choice of units ranging from 564 sq. ft. studios to 4,159 sq. ft. penthouse apartments. Market Square Tower also offers tenants pre-designed kitchens and baths in their choice of Louisiana, Milam, or Preston finishes. 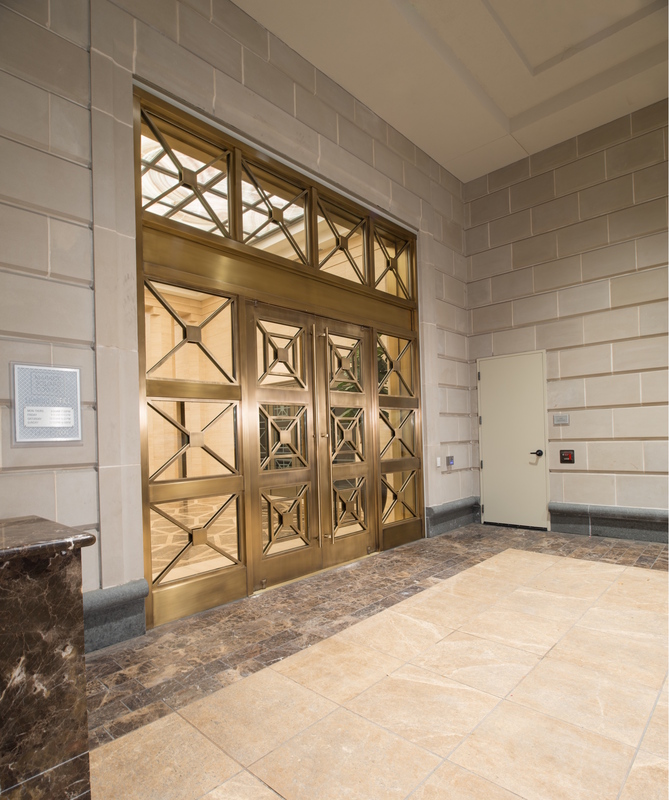 The doors at Market Square Tower are constructed of heavy and durable bronze but operate with ease. The projection of the door leaf is significantly reduced as well, owing to the inset pivot located at two-thirds the width of the door. The inset pivot allows the doors to open and close far more easily by alleviating external wind loads and internal building stack pressures at both sides of the door leaf. Aside from the main entrance, two pairs of doors are located under the carport off Milam Street. The likes of Porsche and Mercedes-Benz can be found as residents utilize the valet service provided by Market Square Tower. 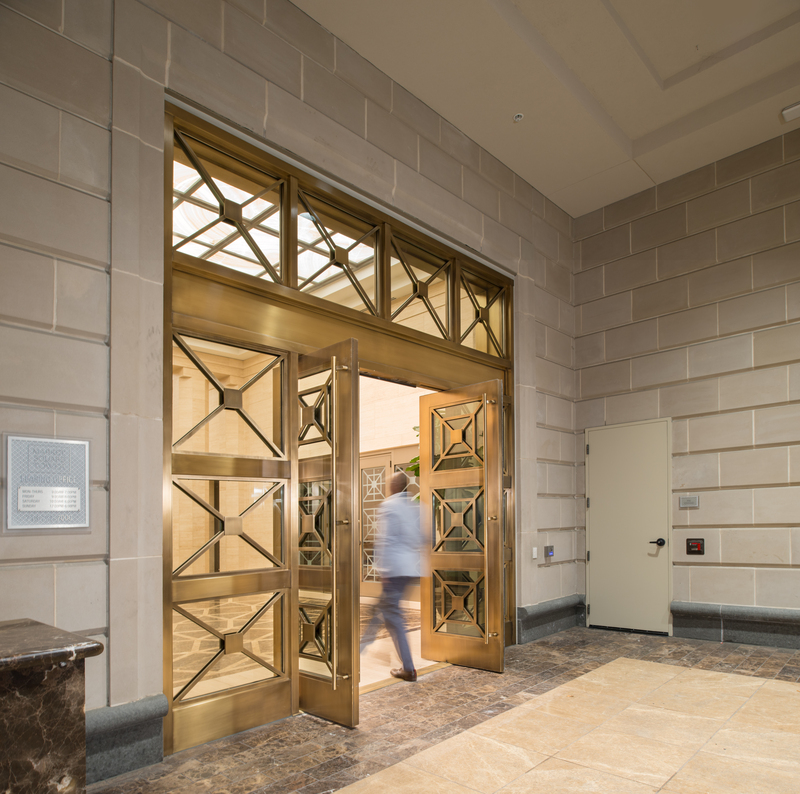 These two entrances are 73” x 104” – slightly larger than the main Market Square Tower entrance of 73” x 95” – all with the classic look of expertly-crafted Ellison formed bronze doors. 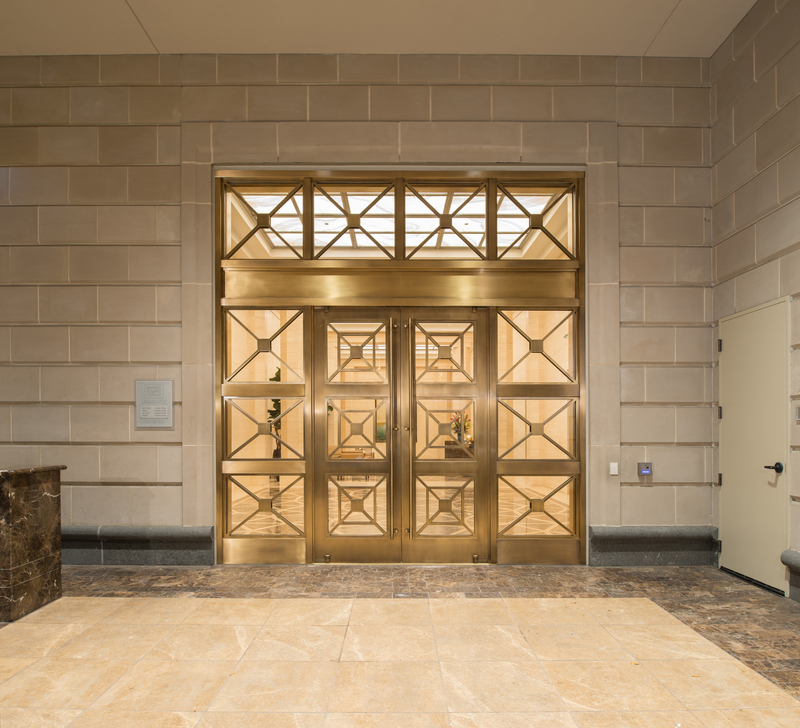 Following the installation, The Lee Quigley Company applied an oxidized final finish to the surface – giving the entrances an attractive sheen with a streaky dark and light effect. Ellison also provides detailed record keeping and full warranties – important when considering the extensive lifespan of an Ellison door. Every door made is imprinted with an individual project number to facilitate easy tracking and maintenance. Furthermore, all Ellison balanced hardware components are machined in-house, which means that replacement components are always readily available. Market Square Tower’s most notable amenity is the see-through, acrylic-bottom infinity pool cantilevered 40 stories above the sidewalk. Other luxury amenities include a sky lounge, conference rooms, indoor basketball court, sky gym, game room, virtual golf simulator, movie theater, and much more. The building promotes a lavish and undemanding lifestyle – down to the effortless operation of Ellison custom balanced doors. The project team also included architect Jackson & Ryan Architects, general contractor Harvey Builders, and glazing contractor Ranger Specialized Glass, all based in Houston, TX.